Stay connected without connections. 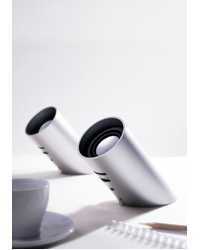 Eliminate desktop clutter with this elegant, sleek and wireless alternative to your standard stereo speakers. Simply plug in the transmitter (which doubles as a clock featuring an aesthetic blue light source) into your computer and your favorite iTunes MP3’s will fill the air via the wireless speakers. Composed of die-cast metal, both speakers are built to last both in terms of durability and unique style. Including an AC adapter for the transmitter, these wireless internet speaker are what’s next in any audiophile’s wish list.